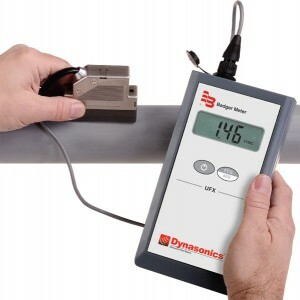 Dynasonics UFX Ultrasonic Doppler Flow Meters provide accurate and reliable flow velocity assessments in closed pipe, liquid systems. UFX requires that the liquid be either solids-bearing or aerated at a minimum of 100 ppm. The product utilizes a single, hand-held transducer which is placed on the outside of metal or plastic pipe. Within seconds after placing the transducer, the large LCD will provide a velocity reading in either FPS (feet per second) or MPS (meters per second). The UFX comes with a flow calculator/slide chart for conversion of velocity measurements to popular volumetric measurements.